Canada does not have safety regulations for LNG export terminals and LNG tanker transports. Transport Canada has not done the research similar to the experiments that were done by Sandia National Laboratories for the US Ministry of Energy to better understand the behaviour of large releases of LNG over water surfaces and the impact of ignition. It seems that Transport Canada lacks the resources to do these experiments promptly, and it could take up to two years or more for these to be completed. The only safety assessment process in Canada that deals with LNG tankers is Transport Canada’s TERMPOL review process. TERMPOL stands for: Technical Review Process of Marine Systems and Transshipment Sites. The TERMPOL review considers an accident worst case scenario to be one compartment of an LNG tanker collapsing. To put this in perspective, the US Coastguard uses the Sandia worst case recommendation of 3 compartments collapsing. The number of compartments collapsing due to an LNG spill tells us how much LNG could be released in case of an accident or an act of sabotage. It gives us an understanding if communities would be put at risk when such an event were to happen. Curiously, Woodfibre LNG considers all compartments of a tanker collapsing to be the worst case scenario. This doesn’t seem to bother Transport Canada, since it continues to use its TERMPOL review with one compartment collapsing as the worst case scenario. Stubbornly holding on to an accident worst case scenario of one LNG filled compartment collapsing, Transport Canada is giving Woodfibre LNG an easy ride, while it shows a serious disregard for public safety. An accident with an LNG tanker or a mall-function at the facility itself, could have potentially catastrophic consequences. The subsequent ignition of a methane cloud could set dry forest and communities ablaze and lead to loss of life. The plan for the proposed Woodfibre LNG plant is all the more precarious since the company is proposing to refurbish and use old decommissioned LNG tankers as floating LNG storage. During the loading of ‘visiting’ LNG tanker, a total of three LNG tankers will be laying side by side. Transport Canada’s conscious and voluntary disregard of the need to use reasonable care, which is likely to cause foreseeable grave injury or harm to persons, property or both, is the definition of gross negligence. Contact Minister Garneau, go to this page where you can find a sample letter and his address. Interesting detail: Because Woodfibre LNG applied in 2013 for the TERMPOL review, Transport Canada will use its outdated 2001 review process to assess the navigational risks of the LNG super tankers coming into Howe Sound, instead of the revised 2014 TERMPOL process. The Sandia National Laboratories found through experimentation that liquid methane released in large quantities over water does evaporate straight up and disperses, as the BC LNG industry and Woodfibre LNG suggest it does. The liquid methane does evaporate, but instead of going straight up, it forms a cold Methane cloud that can travel great distances over water. Once the methane cloud starts to mix with air it forms a highly flammable substance that can be ignited up to 3,500 meters away from the spill source, a LNG terminal or a LNG tanker. 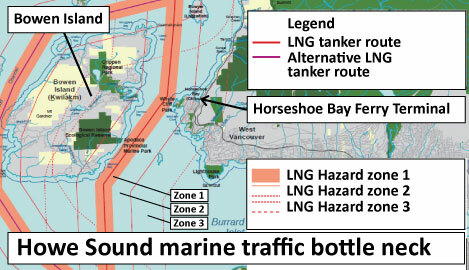 Based on the outcome of the experiments Sandia identified three LNG Zones of Concern (Hazard Zones) which are visualized in this Howe Sound map. The full route to through the Salish Sea, in between the sourthern Gulf Island to the Pacific Ocean can be viewed in the interactive Howe Sound LNG tanker route map. SIGTTO (Society of International Gas Tanker and Terminal Operations) provides its members with a set of guidelines regarding safety. It discourages LNG terminals to be build in narrow water ways, advises to keep LNG tankers routes away from areas away from areas of human population, to not plan LNG tanker traffic through areas with busy marine traffic. When the SIGTTO guidelines and the Sandia zones of concern are applied for LNG tankers coming into Howe Sound the bottle neck is the area between Bowen Island and Whytecliff – West Vancouver: -the Queen Charlotte Channel. Clearly the channel in between Bowen Island and West Vancouver with population centers on both shores, busy marine traffic with almost 80 Ferry movements daily, is a very poor choice for a LNG tanker route. This article in Boston Magazine gives an insight into the security measures taken to bring LNG tankers into Boston’s harbour. 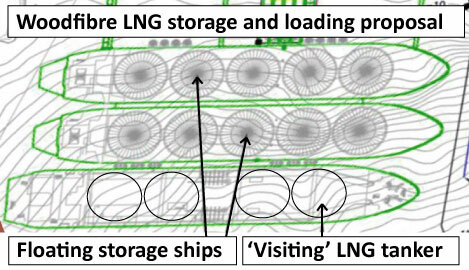 Our observation of the BC Environmental Assessment Office (EAO), in its assessment of Woodfibre LNG’s application for the export terminal and LNG tanker route, is, that it seems to ignore safety findings with scientific backing, like those of Sandia National Laboratories, although these were presented and submitted on a number of occasions. At the same time EAO accepts all the ‘science’ in this proponent assessment driven process and the proponents ‘science’ might not be as reliable or credible as is being suggested. This article in BC Business zooms into the problems with the current environmental assessment process. As it stands now, it could be possible that Woodfibre LNG would receive a “Go” from the BC Government without LNG safety regulations in place! However the ultimate decision lies with the Federal Minister of Environment and the Federal Minister of Transport. The Environmental review, as explained in the section Environment, was transferred from the Federal Government to the BC Government, but the Federal Minster still holds to the power to say ya or nay. Regarding the LNG tanker route, what happens in coastal waters is a Federal responsibility. Our concerns and position are reflected in a Letter from My Sea To Sky prepared by William J. Andrews, Barrister & Solicitor, sent to the Federal Minister of Environment Aglukkaq April 2015. LNG stands for Liquid Natural Gas. Natural gas is a gas mixture of primarily Methane. Methane is a odourless gas and mixed with approximately 10% oxygen is highly flammable.